Bengal Warriors unbeaten run in their home leg came to an end as they lost 31-37 to Dabang Delhi in the Pro Kabaddi League on Sunday. Meraj Sheykh (13 points) was the star for Delhi as he produced a super raid in the last minute to lead them to a win. Maninder Singh got the Bengal Warriors off to a flying start with a super raid in the first minute to lead 3-0. Dabang Delhi recovered from the early shock and fought back to lead 4-3 after four minutes. The first half saw both teams going hard for victory and it was a close affair. Maninder Singh scored with a two-point raid in the 11th minute to give Bengal a 10-8 lead. A costly mistake by the Bengal Warrior’s defence levelled the match 10-10 after 12 minutes. 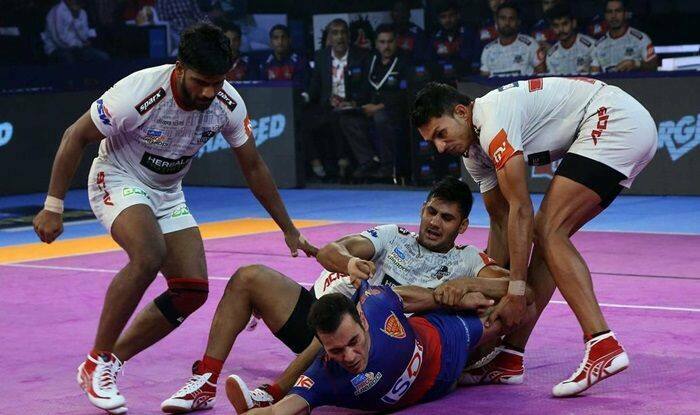 Meraj Sheykh helped Dabang Delhi inflict an all out with a two-point raid in the 16th minute. It took Bengal Warriors 19 minutes to score their first tackle point of the match. A laid back defensive performance meant that Bengal Warriors went into the break trailing at 14-20 at half time. Bengal Warriors made a strong start in the second half. They inflicted an all out and scored 8 points in six minutes to level the match at 22-22 after 26 minutes. With both teams neck and neck there were a slew of empty raids as neither wanted to commit any silly errors. In the 33rd minute Meraj Sheykh came up with a two-point raid to give Dabang Delhi a 26-24 lead. Sheykh followed it up with another two-point raid as he completed his super 10 and gave Delhi a 28-24 lead. Bengal Warriors again forced a super tackle in the 39th minute to tie the match at 31-31. Meraj Sheykh produced a super raid in the last minute to win the match for Dabang Delhi.